CA-Legal Fixed Magazine Rifle, includes 10 round magazine. Click Here for more information. If this item is out of stock at your local RifleGear but available at our other location, no problem. Just place your order and select In-Store Pickup as the shipping method. As long as the item is legal in your location, we will transfer the item for you. You will be notified when your item arrives. 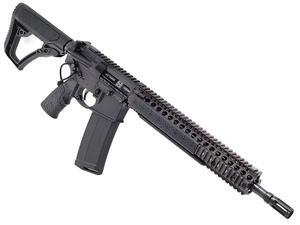 Developed to meet the standards of USSOCOM, the Daniel Defense SOCOM M4A1 RISII features a 14.5"(16" OAL Non-NFA)Cold Hammer Forged Barrel, the Daniel Defense M4A1 RIS II Rail System, a MK12 Low Profile Gas Block and a Daniel Defense Flash Suppressor. Factory CA Version includes an installed 33.3 Tactical CalCatch maglock device and extended rear takedown pin. This device requires the user to disable the action to engage the magazine release. The Daniel Defense M4 Carbine carries a 100% satisfaction guarantee against defects in original materials and workmanship. If your Daniel Defense M4 Carbine shows evidence of such defects, Daniel Defense will make every accommodation to fix, repair, or replace your firearm in the most expeditious and inexpensive manner possible. Daniel Defense does not warranty products or damage caused to our products by the correct or in correct installation of other manufacturer’s products. Be sure to retain your sales slip as proof of purchase date when making a claim. Federal law requires that you be 21 years of age or older to purchase a handgun, frame or receiver. To purchase a shotgun or rifle, you must be 18 years of age or older. 18 U.S.C. Section 922(b)(1). As required by federal law, this item may only be shipped to a dealer with a valid Federal Firearms License. If you do not specify the name and shipping address of your dealer, your order will be delayed. Click here for more information on buying a gun online. WARNING: This product can expose you to chemicals including lead, which are known to the State of California to cause cancer and birth defects or other reproductive harm. For more information, go to www.P65Warnings.ca.gov.